At a recent Latin American Development Bank (CAF) Infrastructure for Development Conference in Buenos Aires, regional experts and policymakers delved into the unique urban landscape for the area, from early approaches to modern challenges around inequality and better service. Pre-Incan hydraulic systems were some of the most advanced in the world. Santos Dumont of Brasil took a flight in Paris in 1906 in a machine heavier than air (just three years after the Wright brothers in the United States). Roberto Landel de Moura of Porto Alegre patented the first wireless telephone in 1901. Buenos Aires opened the first metro system in the southern hemisphere in 1913. Modern projects, like 3,400 kilometers of new highways in Bolivia, new metro rail systems in Lima and Panamá, and comprehensive urban renewal projects in Guayaquil and Monteria are showing the region’s constant progress. But Latin America still compares badly with industrialized nations when it comes to infrastructure, said José Barbero, a well-known author of several studies on the topic. He highlighted two key indicators from the Global Economic Forum: the General Infrastructure Index, in which Latin American countries appear mostly in the fourth quintile, and the Logistics Perception Index, in which the region is also very far from the top countries. Luis Carranza, president of CAF, noted that Latin America is the most urbanized region in the world, but also the most unequal overall. Eighty percent of the population calls cities their home, but the average GINI coefficient, which measures economic inequality on a scale of 0 to 100, is 41 (the OECD average is 31.8). Countries have been too worried about increasing expenditures as a percentage of GDP without spending in an efficient manner, said Garry Bowditch, executive director of the Better Infrastructure Initiative, from Australia. Development institutions, including major banks like CAF, should help governments make more effective investments – to increase welfare, efficiency, inclusion and sustainability – he said. 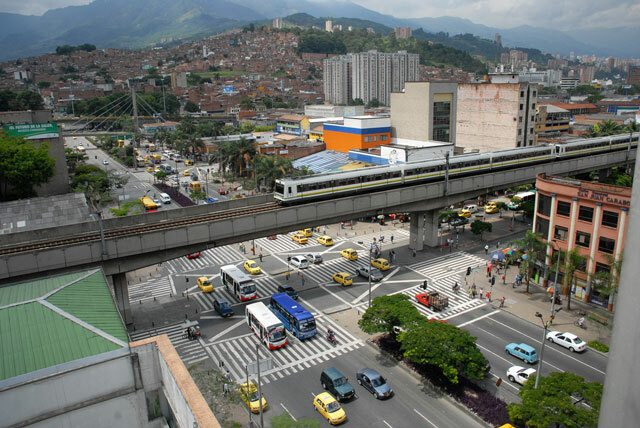 In this context, efforts by Buenos Aires and Bogotá to revitalize their transportation systems warrant closer attention. Both cities’ focus on moving people, not cars, has improved urban conditions in more ways than one. Safer pedestrian walkways, new bicycle infrastructure, public transport priority, and a host of measures to prevent excessive car use – license plate restrictions, parking bans, increased fuel taxes in Bogotá, and demand management including access fees to enter downtown in Buenos Aires – are making streets safer for residents of all income levels while improving access to vital services and jobs, and reducing pollution. Other cities are also investing in mobility infrastructure, but their approach is less convincing. Santiago, Medellín, and México City seem to suffer bipolar disorder, as described by Carlos Cadena Gaitán. While showing great improvements in pedestrian spaces, bicycling and public transport (new metro, light rail, bus corridors, and integration across these modes), they are also building second level expressways, monumental car bridges and underground expressways. Lake Sagaris and Juan Carlos Muñoz, from the Universidad Católica de Chile, said the problem with expressways is that they promote urban expansion and social segregation while not actually reducing congestion. Guillermo Dietrech, transport minister of Argentina, said expressway access to key destinations remains important, but acknowledged the need to be respectful of the urban environment. Providing truck and rail access to the port of Buenos Aires and bus access to the main terminal is the priority of the new Paseo del Bajo expressway, he said. It has underground lanes with truck and bus priority, while the top cover will be a park, like Parques del Río in Medellín. Robin Chase, co-founder of Zipcar, WRI board member, and founder of the Shared Mobility Principles for Livable Cities, echoed Bowditch’s point about wasteful spending, suggesting the concept of fair pricing could solve many problems. Cities everywhere subsidize inefficiency by providing underpriced and free parking and road space to cars, while funding for sustainable and shared mobility (e.g., trains, buses, public bicycles) withers. If driving, riding in and owning a car were priced fairly, the calculus would shift. My own view is that Latin American cities should focus on achieving a “triple zero” vision – zero emissions, zero fatalities and zero exclusions. That is, keep the focus on the basics: connecting people and opportunities efficiently, with an appropriate concern for the environment, road safety and social purpose, as suggested by the Sustainable Mobility for All Initiative. I was asked by Julián Suárez, vice president for infrastructure at CAF, about how to advance this vision. A possible adjustment for CAF and other major development banks is to start measuring the success of transport projects in terms of access, road safety, emissions and redistributive effects, rather than just kilometers of road or rail infrastructure and capital disbursements. In addition, keep creating capacity in these dimensions, rather than the traditional road traffic engineering metrics of vehicle capacity, speed and travel times alone. Alberto Undurraga, former public works minister of Chile, urged attendees not to wait for the future, but to build it. Dimitri Zaninovich, president of the National Infrastructure Agency of Colombia, said the policy environment is changing to be more receptive of new ideas –reservations about large infrastructure investments are something of the past. Robin Chase again urged attendees to think beyond traditional thinking to the effect transport projects can have on social, economic and environmental factors. “Infrastructure is destiny,” she said. The full conference is available online, including further discussions on logistics, public-private partnerships, water and sanitation, energy, and information technologies.